Overview - SEVEN DAYS IN UTOPIA follows the story of Luke Chisolm (Lucas Black), a talented young golfer set on making the pro tour. When his first big shot turns out to be a very public disaster, Luke escapes the pressures of the game and finds himself unexpectedly stranded in Utopia, Texas, home to eccentric rancher Johnny Crawford (Robert Duvall). But Johnny's more than meets the eye, and his profound ways of looking at life force Luke to question not only his past choices, but his direction for the future. When I first glanced at the cover of 'Seven Days in Utopia' I was immediately drawn to the Dove Foundation's "Family Approved" seal proudly displayed on the bottom left corner. This means that the movie is suitable for all audiences and is free of any "questionable" material. Unfortunately, it turns out that the film is also free of any real semblance of drama, romance, comedy, or entertainment value, leaving audiences with a systematically bland experience. Perhaps there should be a similar seal to inform potential buyers of that fact as well. Instead of a dove, I suggest a turkey. Infused with Christian values, the film attempts to weave an uplifting tale about golf and faith. Despite these very good-natured intentions, the movie completely fails to engage, resulting in a thoroughly unoriginal story full of clichéd characters, sugary conflicts, and preachy ideals. After wrecking his car, a down-on-his-luck professional golfer, Luke Chisholm (Lucas Black), ends up stranded in the small town of Utopia, Texas. While waiting for his vehicle to get fixed, he befriends a local rancher, Johnny Crawford (Robert Duvall). Coincidentally enough, it turns out Crawford also has a history with golf, and he soon takes Luke under his wing, mentoring him on the deeper aspects of the game. Wrestling with the numerous pressures of the professional circuit and some nagging daddy issues, Luke attempts to overcome his anxieties and find spiritual peace. Newly enlightened, the young man will have to decide if returning to the golf course is really in his best interests, or if an entirely new destiny is in store for him. The plot is full of numerous inspirational sports story clichés and beats. Luke is trained by Johnny in a fittingly unorthodox style that requires the golfer to not only practice his swing, but fish, fly a plane, and… paint. A romance of sorts develops between the young golfer and a small town beauty (Deborah Ann Woll), and a rivalry forms between a jealous local man (Brian Geraghty). There's even a series of extremely forced flashbacks detailing Luke's longstanding issues with his overbearing father who pushes the sport upon him without ever asking if it's what he wants. Sound familiar? Yeah, I thought so. Even ignoring the fact that the plot and characters are all clichéd and unoriginal, the film still doesn't offer any notable conflict. The whole affair is so excessively saccharine, inoffensive, and family friendly that there is no real drama. All of the dilemmas are wrapped up in a neat, predicable manner and the movie never earns any of its easy and sudden resolutions. The director tries to spruce up some of the action through fleetingly flashy direction (especially in flashback scenes) but the content just isn't up to par (that's right, I went there). Near the end, a montage of the story's major events flash upon the screen. While it would seem that this sequence is meant to bolster the emotional impact of the climax, all it really does is serve to remind the audience what a mundane, lifeless journey the whole adventure has really been. By the end we are supposed to buy that Luke has experienced a life altering epiphany through his time in Utopia, but all I really experienced was boredom. Due to the lackluster scripting and direction, I'm actually quite surprised by the array of talent on display here. Of course, because of the aforementioned lackluster scripting and direction, none of the performers are given anything worthwhile to do. The great Robert Duvall essentially sleepwalks through a standard mentor role. He offers a few words of wisdom, nods knowingly at the camera every now and then, rides a horse, and, well, not much else. Even more troublesome is how the filmmakers completely waste the incredibly talented Melissa Leo. She has a few fleeting scenes but has no actual bearing on the plot. Deborah Ann Woll is similarly underutilized as Luke's "love interest." I write that in quotes because the romance is so subdued that they don't even get to kiss. Lucas Black is certainly the weak link among the cast, which is a shame because he is given the most to do. To his credit, though, it's hard to imagine anyone else doing any better with the poor material. Given the faith heavy focus of the film, I feel that it's important to note that I'm not a religious man. Actually, that's quite an understatement. With that said, however, I have absolutely no bias against films which feature faith based content. Being exposed to different views and ideas is part of the wonder of cinema, and one doesn't have to agree with the opinions on screen in order to enjoy a well told story. Unfortunately, 'Seven Days in Utopia' lacks any air of subtlety, nuance, or evenhandedness in its simplistic examination of the issue, leading to a third act that can often feel rather preachy. The fact that the ultimate message of the film is religious in nature is not what I find problematic. It’s the pedestrian, overly syrupy manner in which the movie presents that message. What a film has to say is only part of the equation. How the filmmakers choose to say it is just as important. In this case, the director's one-dimensional approach falls short of truly engaging on any level whatsoever. 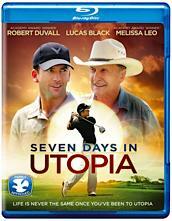 'Seven Days in Utopia' tries to be an inspirational film about golf and faith but utterly fails to inspire. The scripting is unoriginal, the direction is pedestrian, and despite a mostly talented cast, the performances are forgettable. Admittedly, I'm not exactly the intended audience for a religious story like this, and to be fair, the sweet, unobjectionable content might be appealing to some. There are a few scenes that work just fine on their own and the movie isn't completely without merit, but with no real drama the whole thing just ends up bland and preachy. Huge golf enthusiasts and big fans of faith based cinema might want to a take a look, but the average moviegoer is advised to skip this one. Arc Entertainment brings 'Seven Days in Utopia' to Blu-ray on a BD-25 disc that comes packaged in a keepcase. After some skippable trailers, the disc transitions to a standard menu. As mentioned earlier, the packaging indicates that the film is "Family Approved." The movie is provided with a 1080p/AVC MPEG-4 transfer in the 2.35:1 aspect ratio. While not especially impressive, the video is strong in its own right, providing a nice, mostly problem free experience. The source print is in great shape with some light grain visible periodically. With that said, I did detect a very slight hint of banding during one or two transition shots. Detail is good but the picture does have a fairly soft appearance throughout, lacking truly sharp clarity. The small town locals, Texas countryside, and expansive golf courses all come through with pleasing dimension. Colors are nicely rendered with decent pop, but the warm yellow/orange palette doesn't offer much variety. Contrast is high with an occasionally blown out appearance and blacks are deep and consistent throughout. 'Seven Days in Utopia' looks pretty good on Blu-ray. Free of any major technical issues the film's intended aesthetic shines through nicely. Though it never truly wows, the picture suits the material well. The audio is presented in an English DTS-HD MA 5.1 track along with optional English SDH subtitles. Surprisingly expansive but still unobtrusive, the mix does a great job of bolstering the film's visuals. Dialogue is clear and clean throughout. The soundstage is lively without being overbearing, sending appropriate effects around the room. The swoosh and metal clank of Luke's swinging golf club come through with crisp fidelity. Standard nature/crowd ambiance fills the surrounds, naturally enhancing the atmosphere with chirping birds, falling rain, fireworks, and cheering fans. Imaging is also well implemented with several directional sounds (a car driving by, for instance) seamlessly panning from left to right and front to back. A few stylized flashback sequences feature some aggressive effects, offering bursts of more forceful design work. Dynamic range is wide and distortion free and bass activity chimes in with some nice rumble in the score and during the film's tenser moments. Balance between the audio elements remains steady and even. Occasionally enveloping, the mix gives the film a welcomed sense of activity and life. The movie's modest content doesn't exactly call for much, but to the filmmakers' credit the track really does a nice job with what it has to work with. Arc Entertainment has included three very brief and totally useless featurettes. All of the extras a presented in 1080p with Dolby Digital 2.0 audio and no subtitle options. Beyond the Game (HD, 2 min) - Some extremely quick comments from the author/screenwriter dealing with the film's themes are offered in between clips from the movie. PGA Certified (HD, 2 min) - Fleeting comments about the professional golfers featured in the movie are thrown in between more clips from the film. Who's Your Johnny (HD, 2 min) - Even more redundant clips from the movie are provided, this time with quick comments from the cast and crew about mentorship. 'Seven Days in Utopia' is a well meaning but overly saccharine and bland film. I have absolutely no problem with a movie exploring ideas about faith in a family friendly manner, but here the filmmakers fail to offer any real substance or emotion. The goal is to inspire audiences, but I was left with the opposite impression. Thankfully, the video transfer and audio mix are both quite nice, offering a very solid viewing and listening experience. Supplements are pretty useless, however, with some extremely brief featurettes that are mostly just clips from the film. Viewers looking for a faith based golf film with absolutely no objectionable material might want to check this out. All others who don't fit that fairly small niche should skip this one.